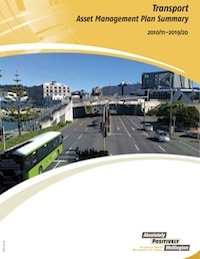 The Wellington City Council – Transport Asset Management Plan Summary is available here. Appendix A of the International Infrastructure Management Manual describes an Asset Management Plan Structure. An outline is provided that includes sections on levels of service, future demand, lifecycle management, a financial summary, asset management practices, and plan improvement and monitoring. The outline provides additional notes for the sections and subsections, including a description of the topics covered, the scope of the topic, and information needed to complete the section. This document includes the following sections: Financial Plan, Future Demand, Introduction, Inventory and Condition, Investment Strategies, Levels of Service, Objectives and Measures, Process Improvements, Risk Management.